oryn Brantz is a two-time Emmy Award-winning author, illustrator, and design professional. Her picture book Harvey the Child Mime was the recipient of the 2010 Moonbeam Children’s Book Award for Best First Picture Book. 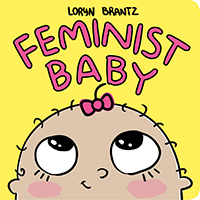 Loryn lives in New York City, where she is on staff at BuzzFeed writing and illustrating about feminism and body image. Sometimes she'll throw up on you! and if you don't like it she doesn't care!